I may have forgotten to mention that I ran a 5k yesterday. 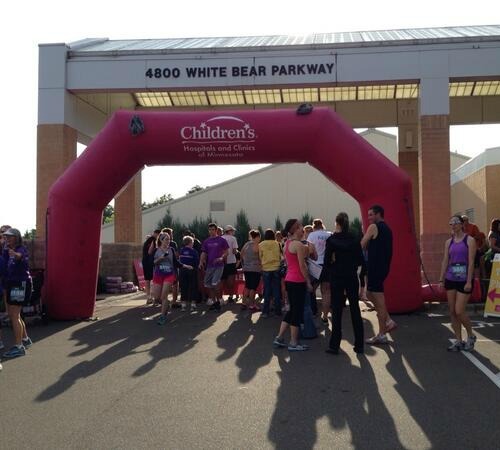 My original 2013 race plans had me heading to my hometown for a 5k this weekend, but instead I went up to White Bear Lake to raise money for children's cancer research. Brady and I got up there early to register, and it was a good thing we did! There were tons of people wanting to register, and only a few people there to check us in. It was cold, too, and I found myself shivering while we waited in line, wishing I had brought a sweatshirt! Doesn't MN know it's August? My goal for the race was to run hard and try to maintain an even effort. Story of my life, right? The race starts at Lifetime Fitness and runs around Birch Lake, staying mostly on the sidewalks. Brady and I ran a warm up to get a preview of the course which was really scenic and relatively flat. When it was time for the 5k to line up, we tried to position ourselves at the front so we wouldn't get stuck behind a bunch of people, even though the race was chip timed. I started my watch as soon as the horn sounded but then found myself at a standstill as the people in front of me trotted ahead across the timing mats. Apparently they weren't in a hurry. For the first 100 meters or so, I was stuck behind a few kids and blocked in by spectators. By the time I made it out of the pack, there were six women in front of me, and they had quite the gap. Rather than worry about it, I just stuck to my own race. The first mile was crowded, with a lot of dodging 5k people that had gone out too fast, and catching up with 10k people. Since we were on sidewalks, it was difficult to maneuver around them and I found myself slowing down more than once to wait for an opportunity to pass. I eventually passed two of the women and was within 10 meters of a third for the majority of the race. I heard my watch beep mile splits but didn't look at it at all until the third mile. The course seemed to drag on forever and I started to develop a sharp side stitch. I just concentrated on staying relaxed and moving my feet as fast as possible until I crossed the finish line. My watch read 21:59 with a distance of 3.17 miles, a 6:56 average pace. I knew that my official time would be a little faster than that, since I started my watch prior to crossing the mat but I also knew that they would call the course 3.1 miles, making my average pace slower. Brady's Garmin said 3.27 miles so I'm pretty sure the course was a little long. My mile splits were 6:49, 7:05, 6:56 and 6:49 (for the last .17). My official time turned out to be 21:52. Still, all my mile splits were faster than the "5k" I ran in June. The takeaway: I need to do more speedwork. Amazing! You are soooo fast compared to me! Also, at my triathlon this weekend, there was a 5K too. The person who won it ran it in 29:20, lol! Apparently all the fast people were doing the triathlon(s)!